Jordan High School hosted a recent visit by a senior staff member from the U.S. Department of Education, who toured two career academies that are being used as models for a national project. Brenda Dann-Messier, assistant secretary for vocational and adult education, visited Jordan’s Aspirations in Medical Services (AIMS) and Architecture, Construction and Engineering (ACE) academies. Dann-Messier, nominated by President Barack Obama in 2009, leads the Education Department’s career and technical education efforts. She oversees 11 grant programs totaling over $1 billion annually and is seeking legislative approval for an additional $1 billion in funding for high school career academies like AIMS and ACE. AIMS and ACE are California Partnership Academies, which are being used as the model for a new national academies project. AIMS was funded in 1990 and is one of the original 49 academies approved as a partnership academy. The medical academy is one of eight Lighthouse Academies in the state whose purpose is to mentor new academies in California. ACE opened in 2007 and is supported by Long Beach Mayor Bob Foster, the school district and multiple industry and community partners. Joining Dann-Messier, was Jerry Winthrop, who oversees California Partnership Academies at the California Department of Education. Lead Teachers Sabrina Arney and Melissa Brookman gathered a panel of representatives from the mayor’s office, Long Beach City College and Cal State Long Beach. Dann-Messier concluded her visit by encouraging students to pursue their dreams with determination and hard work, and she heard positive feedback from students about Jordan’s academies. 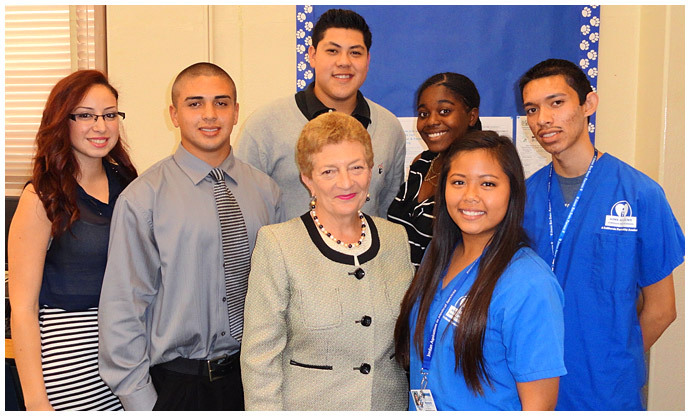 AIMING HIGH – Jordan High School’s AIMS and ACE career academies have captured the attention of national officials, including Assistant U.S. Secretary for Education Brenda Dann-Messier, seen here visiting with Jordan students. The academies are being used as the model for a new national project.